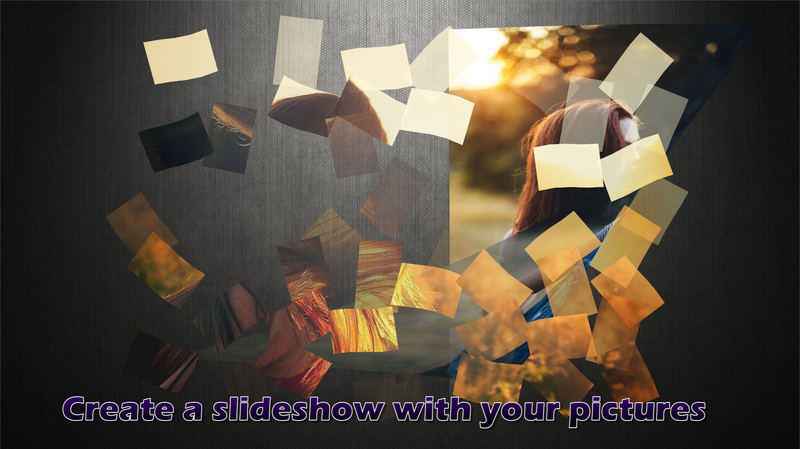 Before you even attempt to create your own slideshow, think about what you'd like to achieve with it. Now think about what you'd like to avoid. If one of your goals is to keep people awake and interested from beginning to end, you're going to have to infuse some excitement into your presentation. 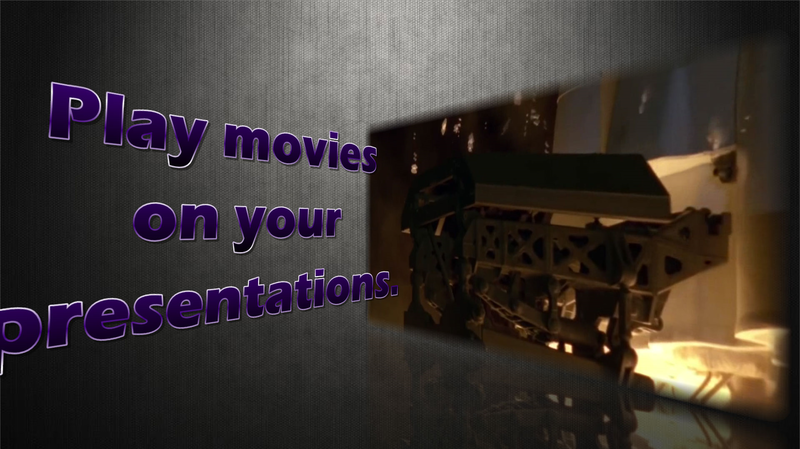 You know, with special effects, animations, and cool stuff like that. And the best, easiest way to do this is? 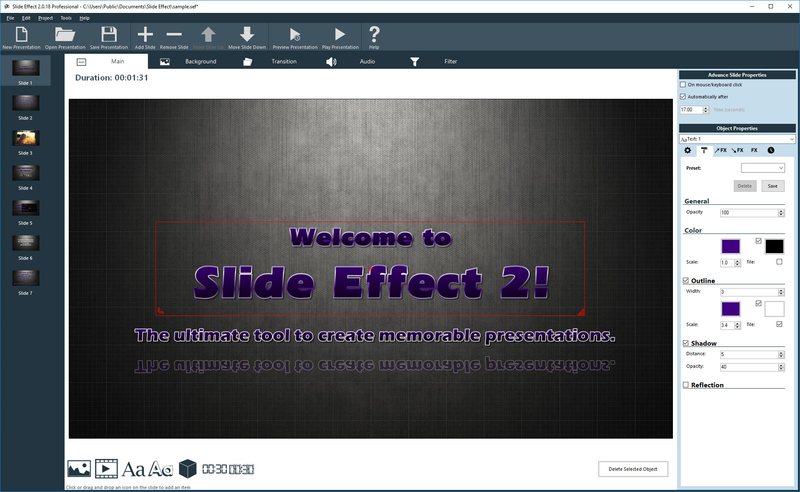 Slide Effect Professional! 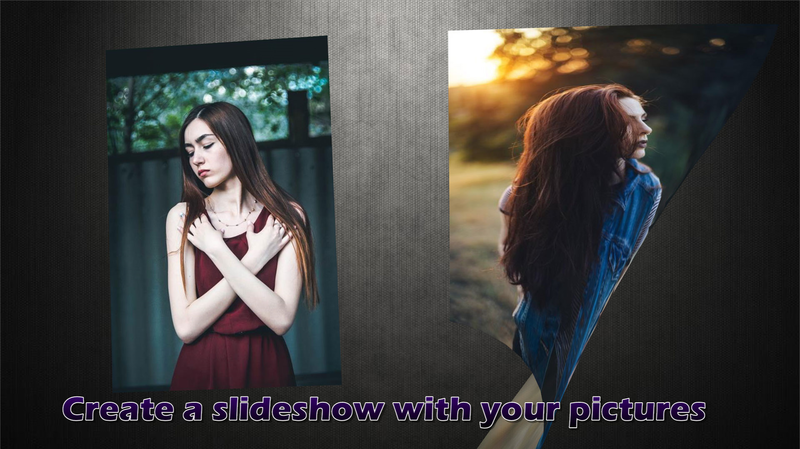 Slide Effect Professional lets you create advanced slideshows with stunning special effects in just a few clicks, and with no technical expertise required! With Slide Effect Professional you can take advantage of your computer's graphics processing abilities to incorporate amazing visual effects that incorporate your favorite photos and movies, even PowerPoint slides. Thanks to a library of predefined backgrounds and transition effects, you can get up and running quickly, producing a fully-realized slideshow presentation within minutes. You can even narrate your presentation, or play several musics along the slideshow. 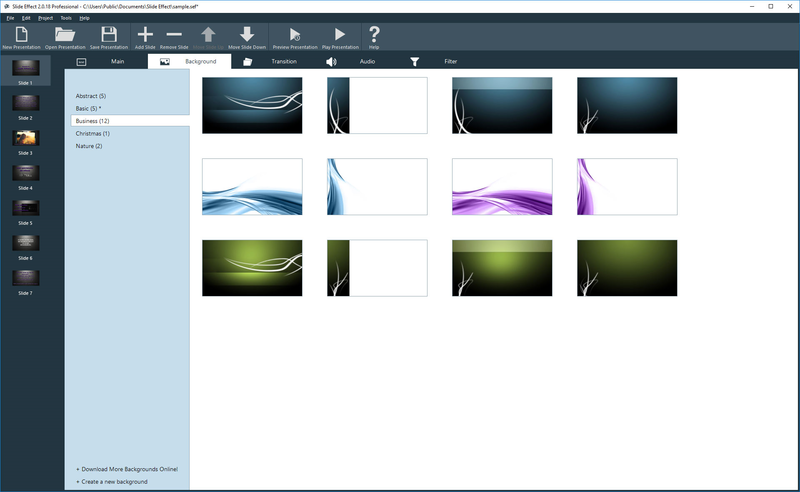 If you end up creating a masterpiece that you'd like to share with the world, Slide Effect Professional makes it a simple affair. 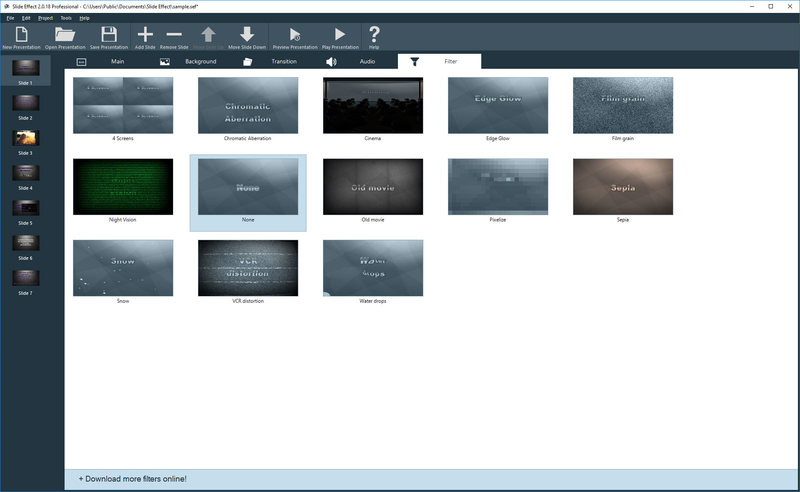 You can publish your slideshows as standalone movies that can be hosted on the web, or distributed on DVD! 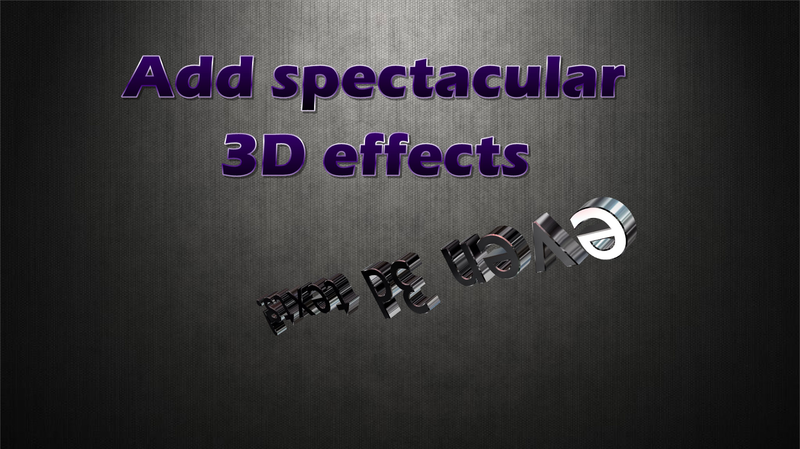 A full featured effect editor to help you create or modify any effect available. Add notes to any slide and display these notes on a second screen when presentation is running. 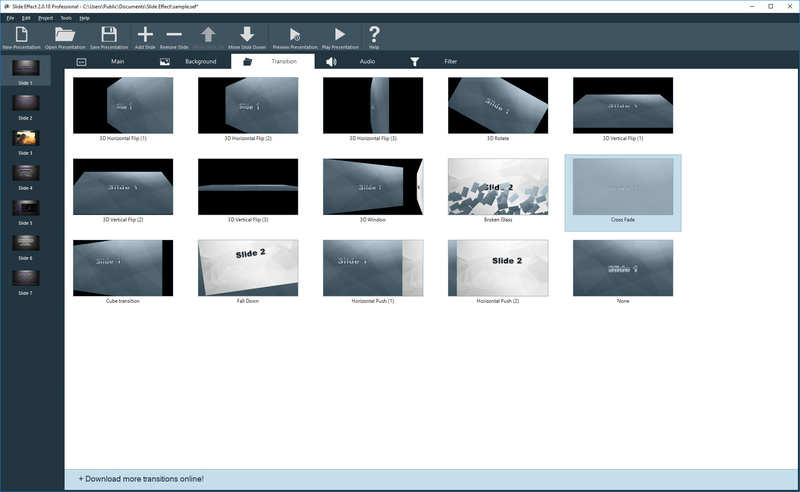 After you purchase Slide Effect Professional it may be used indefinitely. Slide Effect Professional is licensed per user, so if more people are going to use Slide Effect Professional you will need to purchase additional copies. Chuck Can Slide Effect still import/export with PowerPoint? No this feature has been removed, sorry. There were a lot of issues with this export, so I decided to remove it. Stephen Kreyling What new features are planned for the next year? Chuck Lacking PowerPoint import/export capability is unfortunate. Would like to invest to support continued development, but as the product stands I may pass. Alain Bocherens Stephen: mainly bug fixes and new effects/background via the online repository. Jon Spain The features include "Incorporate your favorite media, including PowerPoint slides". So import from PP is OK but not export, right? Alain Bocherens No sorry: this feature is misleading: Powerpoint Import/export is NOT anymore available: it was available on version 1.x of the software but not anymore in 2.x. I forgot to remove this text, sorry about that. Bart User Does the program require activation by internet, if the computer has no internet connection, what then? No need for an Internet connection to use the software. You may notice a slower startup (as the software try to check if there is a new version on our server at startup), but other than that it will work ok.
also on HTML5 or only SWF? DVD i understand, but can it burn from the you program. 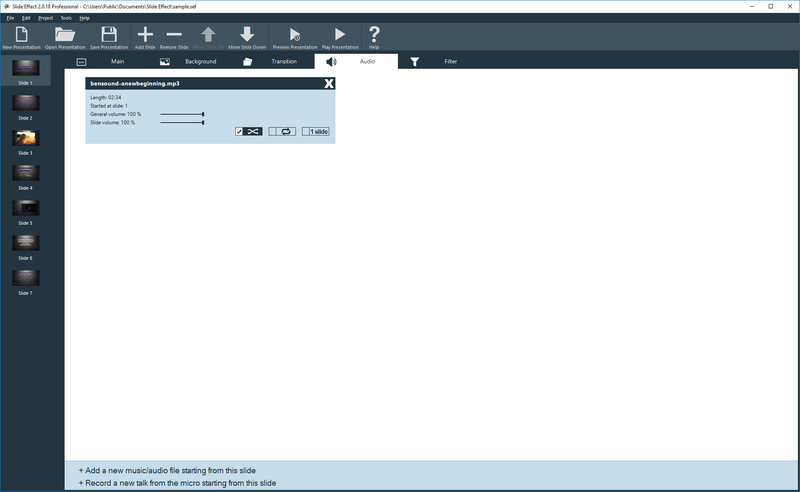 For the web: does it also work on HTML5, or is it SWF Flash based. No you cannot create SWF or HTML5 using Slide Effect (you can do it using Banner Effect, the small brother of Slide Effect). By "shown on the web" I mean using YouTube or the like. To create a DVD you have to burn using another program from the movie file. In any case, you can download the free version to take a look: the export options are similar to the paid version. I would have bought this deal probably if you could just explain more about it and if the trial download link would have worked. Since it is a poor description of the software and the trail download link didnt work I wont test it for $13. Looked promising but to many questions unanswered. If this deal is extended another day then please fix your download link. Also, what is the output file, MP4 ? Share on youtube how? Your site is a little thin thats why I wanted to download the trial. You can output movies as AVI (MP4), MOV(H264) or lossless movies. Yes download is working now. Hope it is possible to add video flat without tilt as in example. Getting it anyway thanks.